Ugh. Divorce was not a snap decision. It was not what I had intended. Yet, there I was standing at a place on life’s road I had never intended on ending up. It was painful. It was hard. It is never pleasant walking through valley of death’s shadow no matter what it is that has died. In those days I learned to cling to hope that at the other end of the valley of the shadow of death lies the house of the Lord. God redeems broken things. Easter, after all, is about resurrection. New life emerges from that which is dead. Behold, God makes all things new. 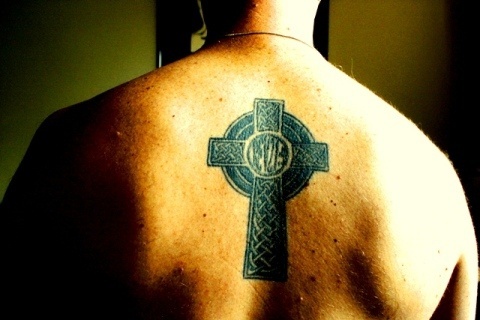 I even had the Rev 21:5 referenced in the crux of the Celtic cross tattooed on my back during that particular stretch of my journey (it was my first tat). I am glad to look back across a decade. I have experienced much, learned much, grown much, and I see things with greater clarity than when I was in the chaos of those stressful moments. This Sunday, as Wendy, Taylor, Suzanna and I celebrate Easter together, I have a deeper and more profound understanding of resurrection. I have experienced a kind of death and resurrection which at once provides me evidence of Easter Sunday and foreshadowing of today’s chapter.